The original inspiration, woven in the summer of 2016 and part of The Pacific Coast Collection - Emily Jefford's Silence and Mystery piece. Click the boxes below to read more about this collaboration and past collection. A second trial before beginning the collection happened in the winter of 2016. 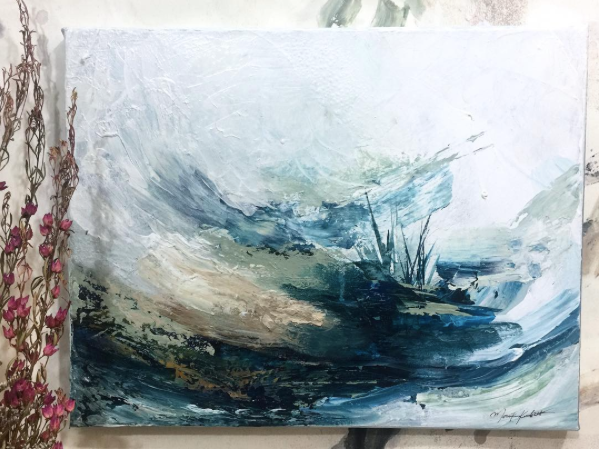 For a makers exchange between a few of my new friends from The Handmade Pop-Up, I wove painter Monika Kralicek's 93rd day piece of 100 days from her 100 days challenge as her gift. Truth be told, I had a slight thought at the beginning of this year that I would continue this collection forever - an open book I just keep writing. My bucket of inspiration drawn from the various painters I've followed over the last few years has been slowly accumulating to a point in which I could support this collection far longer than I would ever intend to. BUT in wake of new directions and ideas waiting to be tested, I have decided to close this collection where I'm at, with 5 of my favorite pieces I've done so far. Vera Neumann's life story and paintings were the inspiration behind my first piece of this collection. A friend introduced me to Vera's work and I immediately fell in love. Prior to this piece, I had mainly woven neutrals with the exception of a few pieces, like the two I referenced above. Knowing that f l o w e r s was my first piece, I understood these colors to complement my neutral palette tendencies. I had been following Lauren Packard's work for awhile before this collection. I find her bold brush strokes to be refreshing and I had always thought that if I were going to introduce color into my pieces, a bold stroke could be beautiful. For me, this piece represents more than a beautiful composition of colors and shapes, it's an underlying representation of the happiness of pushing my comfort zone. This was my interpretation of her This Is Ours. When I say neutrals, I mean all neutrals EXCEPT white. There's a purity about the color that's kept me away; no room for mistakes or experimentation. But for this collection, I wanted to fall in love with white all over again. Weaving beautiful paintings that are imagined on a white canvas, the very place of experimentation for the artist, made me dive into thinking about the structure of a weaving versus a painting. cc: Free Spirit by Kelsie Grazier. Jennifer Gauthier's work has always held such a raw yet clear feeling. The strokes, placement and color palettes are simple yet striking. I chose this "sketch" she had done earlier this year because it reminded me that the quiet moments of sketching and blotting down ideas, are sometimes the most powerful. I saw this strong blank canvas on which she layered texture and color. Wanting to translate that feeling, I chose cotton rope for the canvas and layered embroidery thread, wire, wool, leather, silk and jean-material. While reading Dani Shafer's Journal, I came across her piece called Of This Place and felt so connected as she talked about "falling into patterns". This is something I struggle with every day with my work. In pushing myself to try something new with each piece of this collection, I found this one to be particularly hard. Using the comfortable (to me) weaving technique called 'Soumak', I tried to reinterpret the colors in a very fluid manner. Often with weaving, blending can be very hard with larger fibers. 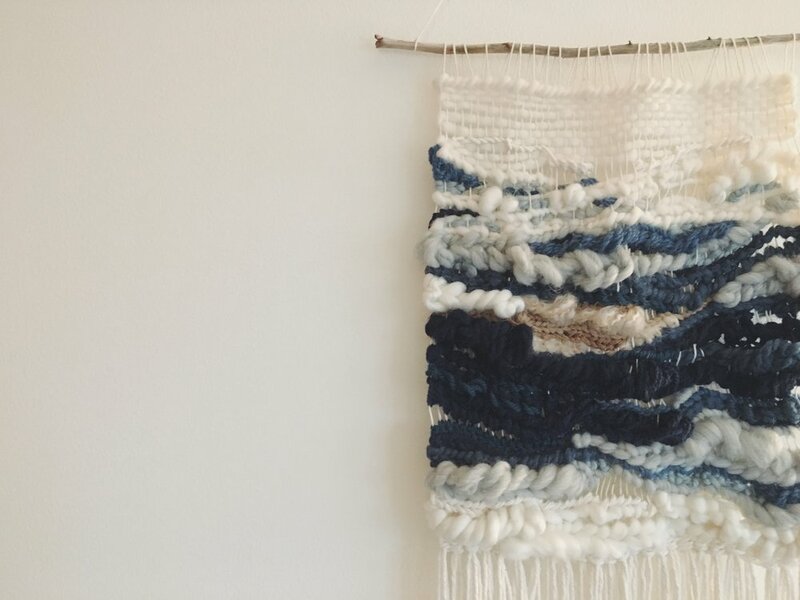 I wanted to understand how to master blending on a large scale; blending with small and large fibers, but also blending with colors that are not common to be seen together in the weaving world. I will always chase after my interests and push myself to do more. I don't believe in average work and I have no intention of letting myself get comfortable with what I do. Where's the fun in doing the same thing day after day? Like the bright colors changed the way I viewed weaving, this collection allowed me to see my work and my ability in a new light. I may not have weaved every painting I set aside to include, but these five weavings taught me so much.